Our very funky newest edition to our Retro Inspired Collection! The iconic Audrey pictured here with her then glamourous trademark ciggarette holder. The gorgeous chest is finished with a thick glossy black lacquer on the top, curvy sides and legs of this piece whilst the front of the drawers is a stunning balack and white print only the wood then finished with think glossy lacquer. 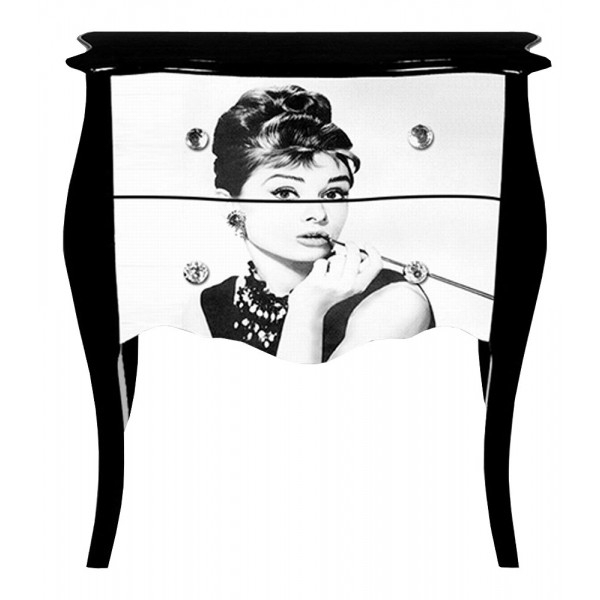 This is our first Audrey piece and we hope to bring out different versions in the future! With 2 drawers and 4 crystal effect knobs (2 on each end of the drawer for ease of opening), this curvacious wooden chest is very glam!